Sargassum fusiforme (Harv.) Setch. (Fam. Furaceae). Botanical Name: 1. Sargassum pallidum (Turn.) G. Ag. ; 2. 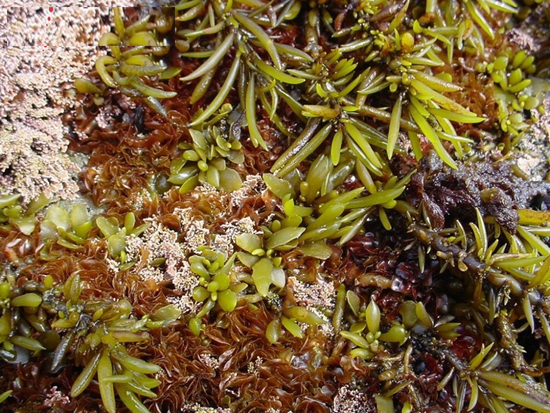 Sargassum fusiforme (Harv.) Setch. (Fam. Furaceae). Common Name: Sargassum, seaweed, Sargassum seaweed. Part Used & Method for Pharmaceutical Preparations: Entire plant. It is collected in summer, cleaned, cut into pieces and dried in the shade. Functions: 1. To resolve phlegm and soften hardness; 2. To promote water metabolism. 1. Goiter. Seaweed (Haizao) is used with Laminaria (Kunbu) in the formula Haizao Yuhu Tang. 2. Scrofula. Seaweed (Haizao) is used with Scrophularia (Xuanshen), Prunella spike (Xiakucao) and Tendrilled fritillary bulb (Chuanbeimu) in the formula Neixiao Lei Li Wan. 3. Edema of the foot or general edema. Seaweed (Haizao) is used with Poria (Fuling) and Alismatis rhizome (Zexie). Cautions & Contraindications: This herb should not be combined with Licorice root (Gancao), as they counteract each other.